Some film lovers believe that the 1970's was the best decade for movies. They felt real, gritty, and dirty. An upsurge of movies came out by directors who were making them cheaper. It was also the decade where top echelon filmmakers would be putting their art out there for the world to see. Scorsese, Coppola, Speilberg, Lucas and DePalma were all young aspiring filmmakers traveling on a new course, with a new destination. Whether out on the sea, or wars in deep space, the films were more ambitious, bigger and exciting than ever before. The Texas Chain Saw Massacre is one of the best films ever made and the raw imagery makes it feel like a documentary. The Exorcist is still scaring people to this day. And every kid with a few bucks and a computer is trying to replicate what Carpenter did with Halloween. Horror films in the seventies was a truly defining decade. The monsters of the seventies were pulled from the headlines; likely somebody you'd run into on the street. Vampires, werewolves, and creatures from the deepest depths weren't nearly as scary or vivid any longer. 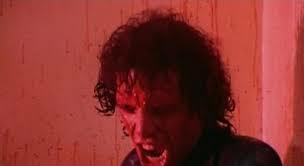 Abel Ferrara's The Driller Killer is one of those films you have to experience a few times to get a full grasp on it. That's not a bad thing either. Great films command that from the viewer. Returning a few times may shed some light on something missed the first time around. To understand what exactly is supposed to be happening and why we may descend into madness is to also understand the character and his development, or lack thereof. From the start of The Driller Killer we know that the character, Reno (billed as Jimmy Laine, but actually played by director Ferrara), just isn't right up in the head. There seems to be a few screws loose. In the very first scene he walks into a church and is mesmerized by a crucifix. An old man with shaggy hair and a beard stares at him and then grabs him. Reno runs for his life, out of the church and into the awaiting squalid streets of New York City. Religious overtones run rampant in Ferrara's films. I'm not sure what this first scene is supposed to tell us. My first guess would be that Reno fears Jesus, and that the old man would be Jesus. Perhaps calling him home; death is knocking and Reno just isn't ready or fears he'll be sentenced to burn. I believe that those thoughts would be swirling in Reno's deranged mind. He's a struggling artist, testy with the people in his life, especially his girlfriend. His apartment is filthy. He's got no money. And now he's being driven even more insane by a punk band that lives in his apartment. The Roosters, headed by singer, Tony Coca-Cola, play the same tune over and over again, with the same groupies hanging on and the same drugs being passed around. I like these scenes. Ferrara is giving us a glimpse as to what the early punk rock scene looked like in New York City. The streets of New York City offers no escape for Reno. He watches as a man is stabbed in the back and robbed. The stabbed man is bloody and writhing on the littered streets as on-lookers just... look. Reno is fixated by this abrupt act of violence. Derelicts line the streets. Reno sees them as nothing more than skittering cockroaches. His slow descend into madness is amped up by the fact that he lives in the city. The city is the real bad guy. Reno is just a rain drop in the storm. From one scene to the next, Reno descends deeper and deeper into madness. Meanwhile, the Roosters continue to play loud and sloppy tunes at all hours. Reno just can't finish his god awful buffalo painting. His art begins to struggle, as if it hadn't already. All throughout the movie Reno verbally assaults his girlfriend as she stares at him with little to no expression. I had to chuckle when her first outburst came from him devouring the greasiest pizza I've ever seen. This pushed her buttons, obviously because he hadn't saved her a piece with green peppers. Reno is forever prisoner in his mind. There's no escaping his abyss. He snaps. What triggers it? I'm not sure. Like I said, from the very first frame of film you can tell he's operating on less than what is needed to function like a normal human being. Reno is Travis Bickle. They're from the same mold. They smolder in the chaos of New York City. Fueled by some inner rage that flickers, only for the moment, then explodes instantaneously. His course of violence is long and brutal. He goes straight for the weak; those derelicts lining the filthy, disease-ridden streets. With his handy drill he mutilates victim after victim. In one particularly gruesome scene we see the drill enter a man's forehead, with no cutaway shot, and continue to burrow into his brain, lobotomizing him. That scene is impressive for the special effect. Reno hunts mercilessly. Unsurprisingly, the film made its way onto the Video Nasties list and was banned in the UK. It's an originator in the slasher sub genre of film, with a high body count and some pretty good violence. The difference between this and other slashers is it takes a while for the killing to begin. It's slow-moving but eventually gets to the goods and holds nothing back. It's real, raw and uncompromising.